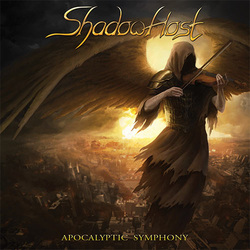 Shadow Host has quietly been on the power metal scene for over 20 years now and although guitarist Alexey Arzamazov is the only original member, the rest of the band has been together since 2011 and have worked towards releasing another outstanding album in the Shadow Host legacy. This is probably one of the more well known and well-respected metal acts that have come out of Russia and they play a pretty frenetic style and have definitely crossed over into a bit of thrash. The music is manic and energetic and focuses on the darker side of fantasy as well as reality. Lunacy Divine begins the CD with a fast gallop and this tempo continues to come on at a near thrash level throughout the first several tracks with Treason and Blinded By Greed matching and possibly overshadowing the debut with some really good music and a fair amount of melodic gang vocals. Empty Eyes comes on and reminds me of such bands as Brainstorm and Cage or even maybe Helstar if James Rivera was not the vocalist. Divide And Rule finally takes the tempo down a notch and amps up the hooky melodies, some really outstanding vocals here, proving the band can do more than play really fast killer music as they can play slower killer music as well! Reborn In Hate comes on and it is pure bay area thrash complete with the gang vocal choruses. Leave it to a Russian band to excel at both bay area thrash and US Power Metal on the same album!! In fact there are no duds to be found on this CD as it is solid as a rock from end to end, even the ballad on here has a certain amount of metal to it! This is one of those albums that doesn't have that one complete standout anthem on it, but I think that is due to the fact that every single track on here just slays it, making it impossible to pick out one or two favorites. Seriously each time I have listened to the CD so far, I came away with a different new favorite!